Warwick Farm trainer Bjorn Baker says the remainder of the year will tell him plenty about three of the best prospects in his stable. Blueblood three-year-olds Nordicus and Rosina Kojonup as well as the lightly-raced four-year-old Connemara will be tested in the coming weeks with eyes on next year’s autumn and winter carnivals. “They’re three exciting horses and what they do in upcoming starts will go a long way to helping us decide what and where their targets will be in 2019,” Baker said. Nordicus was entered for Saturday’s scrapped 3YO Benchmark 76 Handicap (1500m) and now holds an entry for the Benchmark 75 Handicap (1500m) but is unlikely to run with Baker preferring to save the colt for another race next week. A son of Arrowfield Group I-winning residents, stallion (It’s A) Dundeel and Miss Finland, Nordicus was a $900,000 yearling purchase at last year’s Magic Millions Yearling Sale and created a good impression when winning first-up at Randwick on Melbourne Cup day. “I’m not overly keen to take on the older horses with him so while I’ll accept on Wednesday, I’ll be waiting to see the field before a fully commit to a start,” Baker said. “The penny is starting to drop with him and he’s working like a really good horse. 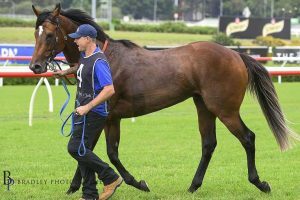 Last week the Baker stable produced She Will Reign’s half-sister Rosina Kojonup which scored an easy first-up win at the Hawkesbury meeting in what read as an extremely strong provincial maiden. “She’s goes pretty well,” winning jockey Adam Hyeronimus told Sky Racing after the win. “She’s still got a lot of improvement to come. Baker plans for Rosina Kojonup to return to the races on her home track at Warwick Farm on Wednesday week in a 3YO Fillies’ Benchmark 64 Handicap (1200m). “There’s never been questions about her ability but mentally she’s been a bit of a work in progress,” Baker said. “She’s making good progress as you saw when she won first-up but she’s not the finished article and the more racing she has the better she’ll get. Rounding out the trio of lightly-raced progressive Baker-trained gallopers is Connemara, the winner of her two starts that is entered to resume on Thursday at Randwick in the Australian Turf Club Benchmark 70 Handicap (1100m). Connemara is a daughter of Fastnet Rock and US-bred mare Sprung and created an impression winning both starts earlier this year.